Size: * 4 lb. 12 lb. Healthy Body Mass- To help maintain lean muscle mass, we use quality animal protein sources such as deboned turkey, chicken meal and salmon meal. We also guarantee levels of L-Carnitine as it helps the body utilize fat. Reduced Fat & Calories- Along with exercise, less active dogs can achieve their ideal weight with 26% less fat and 10% fewer calories than Wellness Small Breed Complete Health Adult Turkey & Oatmeal Recipe. 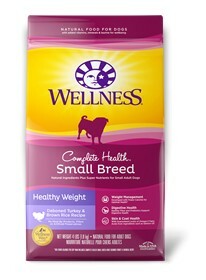 Also great for Small Breed seniors with slowing metabolism. Deboned Turkey, Chicken Meal, Salmon Meal, Rice, Rye Flour, Ground Brown Rice, Oatmeal, Ground Barley, Tomato Pomace, Pea Fiber, Menhaden Fish Meal, Natural Chicken Flavor, Chicken Fat (preserved with Mixed Tocopherols), Tomatoes, Salmon Oil, Ground Flaxseed, Carrots, Spinach, Potassium Chloride, Apples, Sweet Potatoes, Blueberries, Vitamin E Supplement, Choline Chloride, Mixed Tocopherols added to preserve freshness, L-Ascorbyl-2-Polyphosphate, Taurine, L-Carnitine, Zinc Proteinate, Zinc Sulfate, Calcium Carbonoate, Niacin, Ferrous Sulfate, Iron Proteinate, Yucca Schidigera Extract, Beta-Carotene, Glucosamine Hydrochloride, Chondroitin Sulfate, Chicory Root Extract, Vitamin A Supplement, Copper Sulfate, Thiamine Mononitrate, Copper Proteinate, Manganese Proteinate, Manganese Sulfate, d-Calcium Pantothenate, Sodium Selenite, Pyridoxine Hydrochloride, Riboflavin, Vitamin D3 Supplement, Biotin, Calcium Iodate, Vitamin B12 Supplement, Folic Acid, Ascorbic Acid (Vitamin C), Dried Lactobacillus plantarum Fermentation Product, Dried Enterococcus faecium Fermentation Product, Dried Lactobacillus casei Fermentation Product, Dried Lactobacillus acidophilus Fermentation Product, Rosemary Extract, Green Tea Extract, Spearmint Extract.